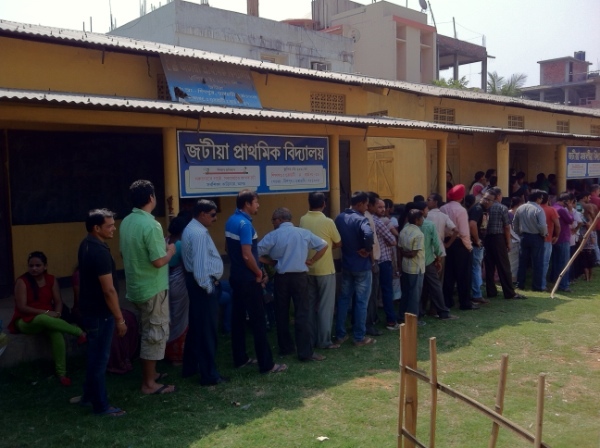 Polling is underway for the sixth phase of the Indian election, in 117 constituencies in 11 Indian States and one Union Territory as millions of voters braved the sweltering summer heat to cast their ballots on Tuesday. Indian debt, currency and equity markets remained closed on Thursday as the financial capital Mumbai goes to polls. The Indian Prime Minister Manmohan Singh, who represents the north eastern state of Assam in the upper house of the parliament since 1991, cast his vote on Thursday morning in the city of Guwahati. Polling is also underway in 12 seats in the critical northern Indian state of Uttar Pradesh, which sends 80 of India’s 543 lawmakers to parliament. Security was tightened in six constituencies in Assam and one in Kashmir with more than 75 companies of security forces deployed where sporadic incidents of pre—poll violence occurred. 815 million voters are casting their ballots in nine days of voting for a new parliament in the world’s biggest ever election. Voting runs until May 12 and results are due on May 16. Many opinion polls, taken in the first week of April, said the right-wing Bharatiya Janata Party and its allies were forecast to emerge as the single largest party, ahead of the ruling Congress Party. “We need parivartan (change),” said 65 year old Ramesh Borkotoky at a polling booth in Dispur, the capital of the state of Assam. “There has been development here, but things need to move faster, and we need to catch up with neighbouring China,” he added. The ruling Congress party has run the country for more than 50 years since India achieved Independence from colonial rule in 1947. The challenger, Narendra Modi, the prime ministerial candidate of the BJP, has promised to generate jobs and bring New Delhi back to its high-growth years. A disputed role in 2002 in one one of the worst communal carnages in recent history, however, has clouded Modi’s pan-India appeal.